1. Ownership – in order to take back control of our lives excruciating honesty is needed. Until we can take ownership of our ‘stuff’ we will continue to blame someone or something else for our predicament. This habit leads to our power draining away. It’s time to take ownership of your life! 2. Courage – once we have been honest about who we are and the position in which we find ourselves transformation can begin. However no positive change is possible without courage. This is a position that requires us to act in spite of our fears. 3. Faith – faith is not a position free of doubt, faith is the virtue that inspires us to act in spite of doubt. To reclaim your personal power, both courage and faith are needed. So do not let any doubts you may have deceive you as they are often part of the learning process…. Remember, faith and courage will help you win the day. 4. 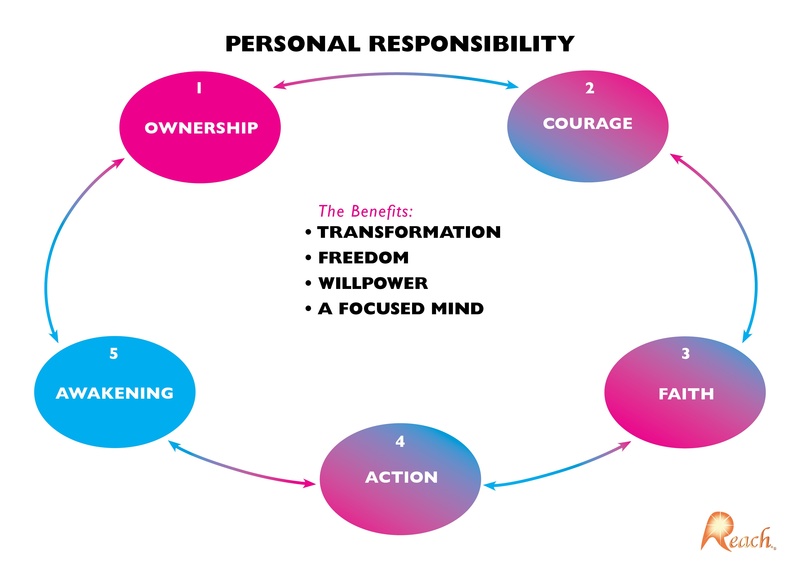 Action – personal responsibility is about realising you are the major shareholder in your life, and so at some point you will need to do what is necessary and right for your own progress. This is not something someone else can do for you. You must take action as if your life depends on it…. because it does! 5. Awakening – an awakened mind lives in a place of truth, a place beyond denial and justification. And as a result it does not become enslaved by negativity and old patterns. The awakened mind has the courage of its own convictions and never knowingly causes harm to another in the pursuit of what it believes to be right. It always seeks to act with conscience and integrity. Take responsibility for your life today for only then can you see what needs to be done! Practise staying awake.